SUMMARY: We report the first 3 cases in which CT disclosed herniation of the body of the buccal fat pad into the maxillary antrum. Only 20 cases of traumatic herniation of the buccal fat pad have been described in the literature. In all except one instance, the buccal fat pad herniated into the oral cavity. The only previous report of herniation of the buccal fat pad into the maxillary antrum is in an article published before modern cross-sectional imaging, and the diagnosis was not made preoperatively in that case. Modern metropolitan trauma centers see large numbers of patients with major and minor facial trauma, usually due to motor vehicle collisions, falls, and assaults. Nonetheless, traumatic herniation of the buccal fat pad is an unusual injury, with a recent review finding only 20 such cases in the English literature. All except one of the reports described herniation of the buccal fat pad into the oral cavity. The only previous report of herniation of the buccal fat pad into the maxillary antrum is in an article published in the pre-CT era.1 To our knowledge, we are the first to describe the CT findings in such cases. A 27-year-old man was brought to the emergency department after sustaining abdominal and facial trauma in an assault. Physical examination revealed irregularity of the left zygomatic arch and the left lateral orbital wall consistent with a zygomaticomaxillary complex (ZMC) fracture. There was no facial hypesthesia and no diplopia. It was believed that the victim was kicked in the infratemporal fossa because of the logo of a sneaker manufacturer and sole marks imprinted on the contralateral side of the face. CT (Fig 1) confirmed the presence of a minimally displaced left-sided ZMC fracture, as well as herniation of the body of the buccal fat pad into the left maxillary antrum. Following supportive care and incision and drainage of a hematoma of the right pinna, the patient was discharged with oral amoxicillin and pain medications. Because the malar eminence, zygomatic arch, and orbital fractures were essentially nondisplaced and there was no evidence of optic nerve impingement or extraocular muscle entrapment, the decision was made that no reduction of the ZMC fracture was necessary. The patient was readmitted to the otorhinolaryngology department 10 days after discharge with right perichondritis secondary to noncompliance with oral antibiotics. He was treated with incision and drainage and intravenous ciprofloxacin. The patient was discharged with oral ciprofloxacin and a follow-up appointment with the otorhinolaryngology department. No further imaging was performed. Case 1. 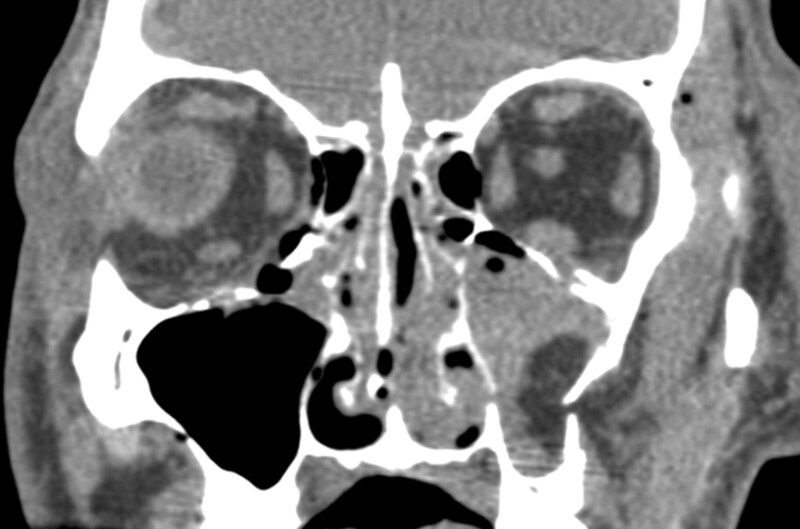 Axial CT image reveals fractures of the lateral and anterior walls of the left maxillary antrum. Herniation of low attenuation fat into the maxillary sinus is evident. The lateral maxillary antrum fragments form a “flap valve” trapping portions of the buccal fat pad within the antrum. 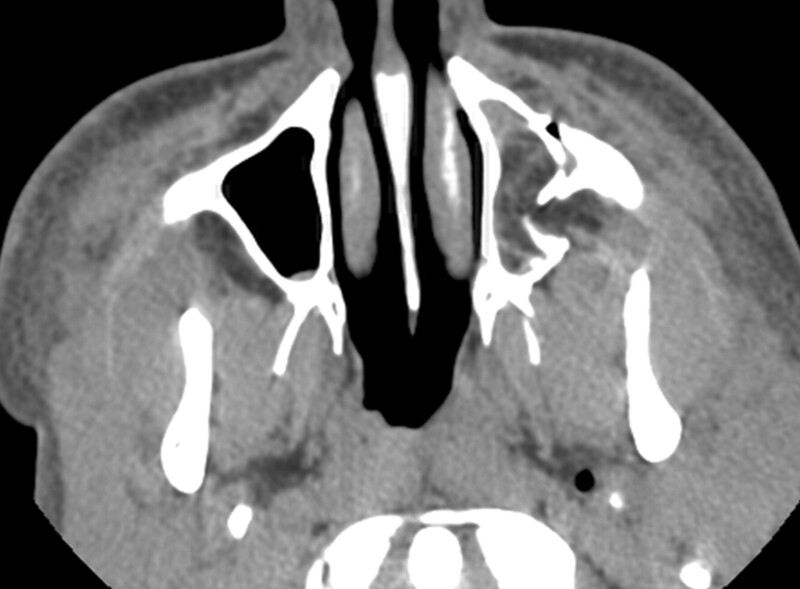 Note a minimally displaced fracture of the left lateral pterygoid plate. Other images (not shown) demonstrated minimally displaced fractures of the left lateral orbital wall and left zygomatic arch. A 31-year-old man was brought to the emergency department after sustaining an assault to the face and head. The patient was combative and in respiratory distress. CT of the brain revealed a small epidural hematoma overlying the left temporal lobe and a small amount of pneumocephalus. CT of the facial bones (Fig 2) demonstrated a left ZMC fracture with comminution of the zygomatic arch, comminution of the lateral wall of the maxillary antrum, and herniation of the body of the buccal fat pad into the antrum. Additionally noted was a fracture of the left greater wing of the sphenoid with extension into the left temporomandibular joint and sphenoid sinus. There were fractures of the lateral orbital walls bilaterally, bilateral fractures of the anterior walls of the maxillary sinuses and inferior orbital rims, comminuted fractures of the nasal bones, and fractures of the pterygoid plates. The injuries constituted most of the components of Lefort II and Lefort III fractures bilaterally. The plastic surgery department had planned to surgically repair the facial fractures following stabilization of the patient’s epidural hematoma and respiratory distress. However, the patient signed out of the hospital against medical advice before treatment of his facial fractures. The patient twice returned to the emergency department with anterior shoulder dislocations 3 and 4 days after his initial admission. Both return visits ended in the patient signing out of the hospital against medical advice. No further follow-up was available. Case 2. 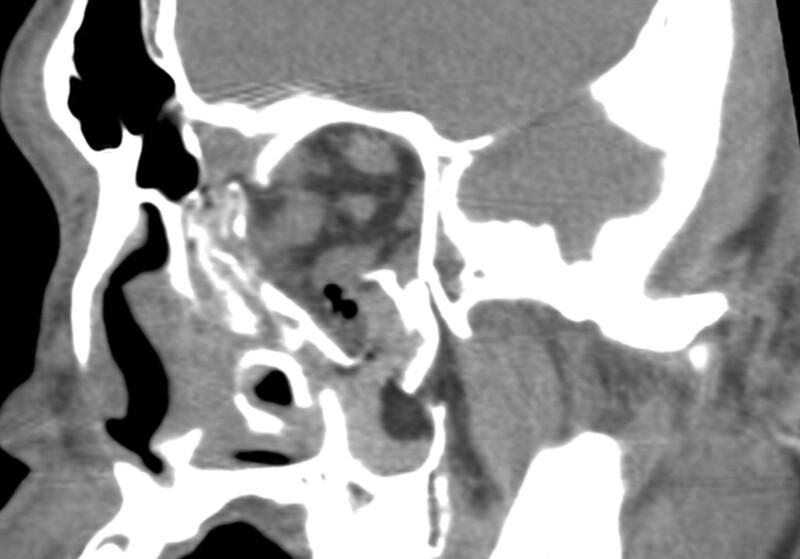 Coronal reformatted CT image shows the buccal fat pad herniating into the maxillary antrum via a fracture of its lateral wall on the left. There are fractures of both orbital floors, the lateral wall of the right maxillary antrum, and the medial wall of the left maxillary antrum. Other images (not shown) disclosed fractures across the bridge of the nose, fractures of the lateral walls of both orbits, and fractures of both inferior orbital rims. A 19-year-old man with diabetes was brought to the emergency department after sustaining facial trauma in an assault. The emergency department course was complicated by tachycardia, with an initial heart rate of 140. The heart rate increased to 200 on attempted intubation and was treated by aggressive doses of beta blockers. Subsequent testing revealed severe hyperthyroidism. A consulting endocrinologist believed the patient may have had acute thyrotoxicosis (thyroid storm) precipitated by trauma.2 The patient was treated with propylthiouracil and Lugol’s solution. Hyperglycemia was managed with insulin. Facial CT (Fig 3) revealed fractures of the posterolateral wall of the left maxillary antrum with resulting herniation of the buccal fat pad into the maxillary antrum. There were “blowout” fractures of the left lamina papyracea and the orbital floor, with herniation of orbital contents into the medial ethmoid air cells and maxillary antrum. The orbital injuries resulted in the left intraocular pressure rising to 90 mm Hg, necessitating emergency lateral canthotomy. The patient developed severe hypokalemia, believed secondary to insulin therapy, and was treated with replacement potassium chloride. Operative reduction and internal fixation of the facial fractures are planned after the patient’s endocrinologic and metabolic status is stabilized. Case 3. Oblique CT image perpendicular to the long axis of the left orbit. Note a fracture of the posterolateral wall of the left maxillary antrum allowing herniation of the buccal fat pad into the antrum. Also present are “blowout” fractures of the orbital floor and lamina papyracea, allowing herniation of orbital contents into the antrum and ethmoid region, respectively. Other injuries (not shown) included fractures of the left lateral orbital wall and anterior portion of the left zygomatic arch. Traumatic herniation of the buccal fat pad is an unusual injury. A recent case report and literature review found only 20 cases in the English literature.9 All except one of the cases involved herniation of the buccal fat pad into the oral cavity, frequently due to a penetrating injury in a child.9 In the sole reported case similar to ours, Marano et al1 described traumatic herniation of the buccal fat pad into the maxillary sinus in a patient with a ZMC fracture. That patient was struck in the face with a wooden club. Preoperative radiographs revealed the ZMC fracture with opacification of the inferior portion of the maxillary antrum and what was believed to be an air/fluid level. However, antral herniation of the buccal fat pad was not suspected preoperatively.1 In that instance, significant displacement of the fracture fragments necessitated operative reduction. Following the opening of the maxillary antrum via an incision above the superior alveolar ridge, loose fragments of bone were removed and the buccal fat pad was retracted from the maxillary antrum.1 Marano et al then packed the maxillary antrum with iodoform gauze, intending to prevent reherniation of the buccal fat pad into the antrum.1 CT affords the surgeon the opportunity to plan reduction of complex facial fractures, without surprises such as herniation of the buccal fat pad into the antrum. Because of the apparent rarity of this injury, we were surprised to see 3 cases in a little more than 3 months. Our 3 cases and that of Marano et al1 share several features. All 4 cases were assaults, so it is possible that the herniation of the buccal fat pad was caused by a direct blow to the infratemporal fossa, fracturing the posterolateral wall and driving the buccal fat pad into the antrum. The blow can be delivered by a wooden club1 and the toe of a shoe (our case 1), among other possibilities. Interestingly, all 4 cases involved the assault victim’s left side, which is consistent with a right-handed assailant striking the victim’s face from the front (or kicking a facedown victim with the right foot). In our patients, inward displacement of the lateral antral wall allowed herniation of the body of the buccal fat pad into the maxillary antrum. In all 3 instances, the fragments formed a flap valve configuration, trapping the buccal fat pad in the antrum. Anatomically, the body of the buccal fat pad is adjacent to the lateral wall of the maxillary sinus3 and forms the leading edge of the herniated portions of the buccal fat pad. The remainder of the components of the ZMC fracture were essentially nondisplaced in case 1, so the decision was made not to reduce the fracture. Nonetheless, close follow-up will be needed because of the possibility that the herniated, ischemic portions of the buccal fat pad will become superinfected. Gangrenous (ischemic) necrosis was described in one of the cases of herniation of a portion of the buccal fat pad into the oral cavity,9 theoretically increasing the risk of infection. In addition, because of the close proximity of the parotid duct to the buccal fat pad, the possibility of parotid duct injury or displacement could lead to complications such as sialadenitis, for which the patient should be followed. In case 2, surgical intervention was planned; however, the patient signed out of the hospital against medical advice on multiple occasions. Patient 3 awaits operative repair and internal fixation of his significantly displaced facial fractures. We thank the anonymous reviewers and the editor for helpful suggestions. Accepted after revision November 30, 2005.